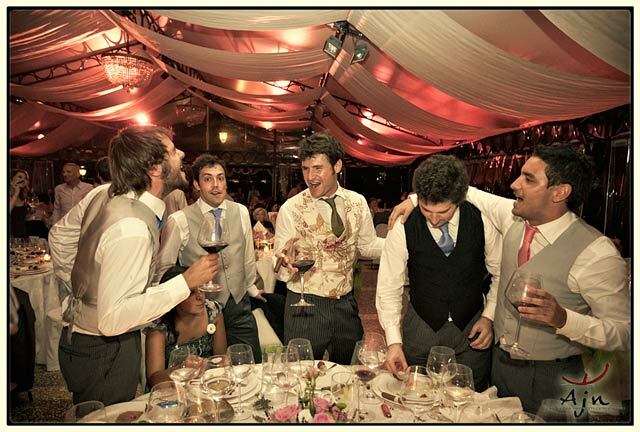 Home » Lake Maggiore Weddings » Lina & Borja: Lake Maggiore’s Wedding of The Year! 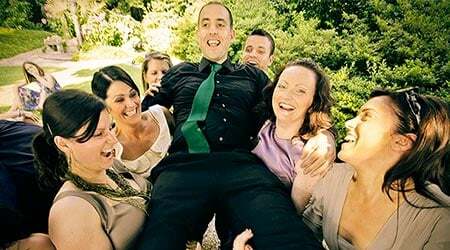 As the administrator for Italian Lakes Wedding it is rare that I have the opportunity to meet our brides and grooms ‘to be’ in person. Face to face meetings are usually the perogative of the wedding planner, floral designers, photographers and other professionals involved with the wedding day itself. I was fortunate enough to have met Lina quite by chance during Melanie and David’s ceremony at Villa Rusconi. 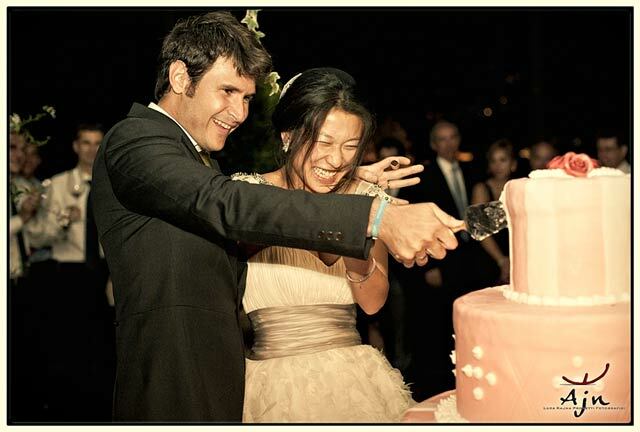 In my modest opinion Lina and Borja’s wedding at Lake Maggiore was indeed the event of the year, making July 17th 2010 a memorable date! ina is a young girl of Chinese origin but 100% Italian. Born and raised in Verbania, she has travelled extensively including Japan, China and The United States before choosing to live with Borja in Spain. What struck me most about Lina was her great enthusiasm and profound affection for her home town and the surrounding area of Lago Maggiore. This played a huge part in her decision to select Verbania as the destination of her wedding day, also because it was an opportuntity to share her love of the area with guests, in order that they too could experience the pleasure of discovering the extraordinary beauty of this area. Her emotional attachment transformed Lina into a kind of honourary Ambassador for Lake Maggiore, at least for a day! Lina and Borja’s wedding was indeed a fantastic blend of different cultures and traditions: more than 200 guests coming especially from all over the world attended, notably those from Spain, America, Japan, Italy and China (some of whom are also residents of Italy). We felt extremely fortunate about how things turned out and had decided that it would be wonderful to marry in my home town, especially because we will spend most of our time in Madrid. For me Verbania is the place in which I was born as well as a beautiful location. I feel so proud to have been able to share this wonderful place with others who have never visited and perhaps didn’t even know about its existence. All of our friends from elsewhere were very impressed by what they saw and by all the close attention to detail. 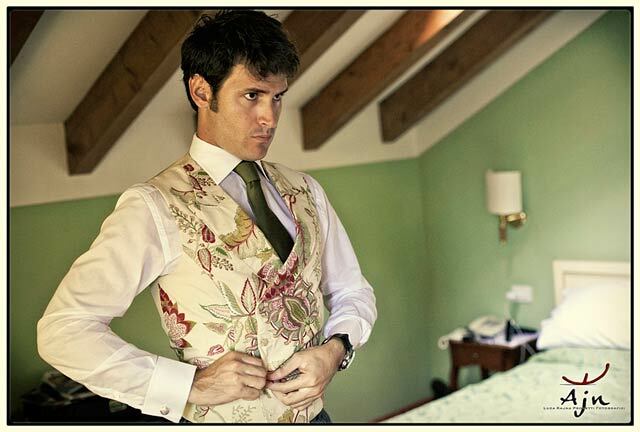 Great attention to detail was definitely a main feature of Lina and Borja’s wedding. Nothing was left to chance… from the wedding decorations for the ceremony and dinner, the video set up complete with steady cam and crane, to the flower arrangements, music and above all… the bride’s especially designed wedding dress and groom’s unique apparel. My wedding dress was designed by Rosario Diaz, a stylist from Madrid. 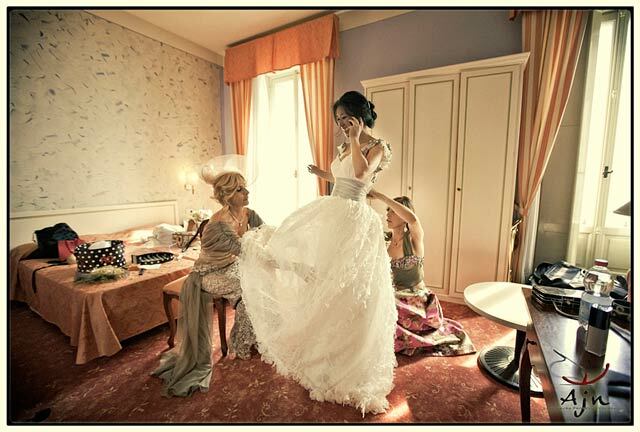 Rosario Diaz is an expert in designing and creating individual wedding dresses. 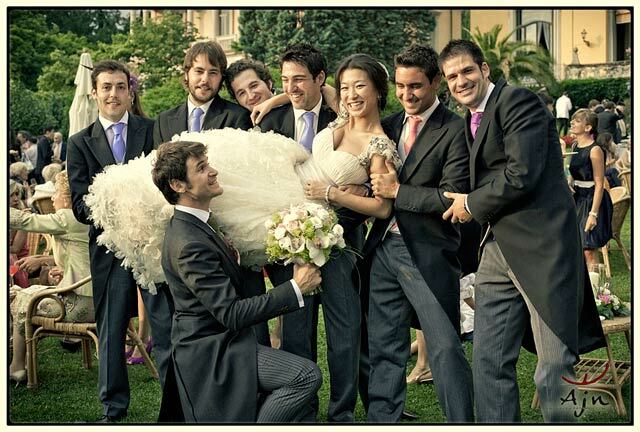 We chose Rosario because he exclusively designed a wedding dress for Borja’s sister. The hunt for my own dress started with other ateliers but none of them convinced me completely. Rosario showed us various kinds of fabric that had just arrived and I completely fell in love with material with a floral motif and ‘shredded’ effect made by laser that became the base of the gown. The rest of the detail was added a step at a time and after several stages of experiment. The finishing touches were the ‘pettinino’ and fan effect, reminiscent of the Spanish tradition. The sleeves were decorated with tiny pearls, stones and ‘plisse tulle’. The idea was to add a touch of colour to the sleeves and bearing in mind that the belt was grey we decided that this was the best option. Borja’s west was tailored using a curtain fabric that we loved. We wanted something special for him, considering that men don’t have a vast choice regarding wedding suits. We discovered a very skilful tailor with experience in working with rich cotton and who was able to create a lovely west with such a dense fabric. 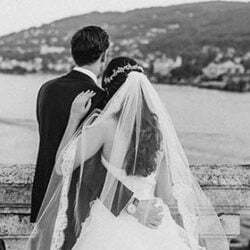 The process of planning the wedding began a year in advance and was closely followed by Valentina Lombardi, who is a specialist in arranging weddings in Lake Maggiore. The very first contact with Lina was by email via our web site. 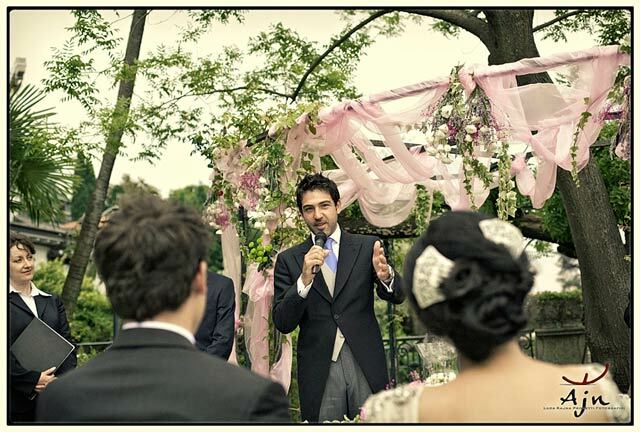 Lina had very clear ideas and wanted to arrange her wedding at Villa Rusconi Clerici. We decided to meet in Verbania to start the full planning procedure. At that time I had also had the pleasure of meeting Lina and Borja’s families and practicing a little Spanish too! After the visit to the villa all the main features and details were mainly organized via email together with a couple of further face to face meetings. Lina was such a sweet bride and paid close attention to each detail. 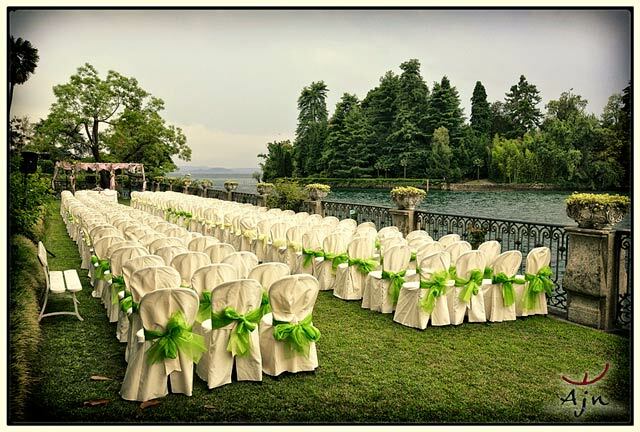 She had in mind a romantic wedding based on the shades of pastel pink and green to match the fairy tale landscape of Lake Maggiore. And to our immense mutual satisfaction, together we did it! The Floral arrangements were taken care of by Monika and Paola, floral designers of La Piccola Selva. After a couple of emails I met Lina personally a few months before her wedding day. She explained how she imagined her wedding and the flowers. I perfectly understood Lina’s ideas. As floral designer I loved working with her and I was really proud of the work we achieved for Lina and Borja’s wedding. For the ceremony we embellished the villa gazebo with pink organza, lavender, white lysianthus and pink gypsophila. The idea was to make the gazebo pretty end elegant, with a flowing decoration of flowers that were in harmony with the enviroment. Lina’s bouquet was really special! 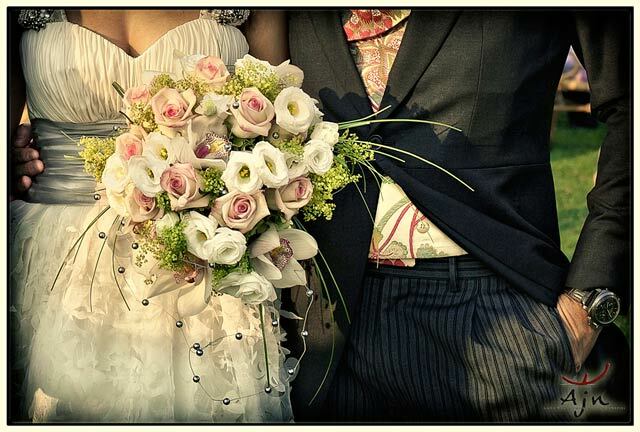 Monika created it with Cymbidium orchids, Alchemilla, white Lysianthus and Dolce Vita roses. Little pearls kept together by a thin silver wire adorned the bouquet giving to it a very elegant final touch. Monika created a real masterpiece to match Lina’s wedding dress and Borja’s floral patterned west. 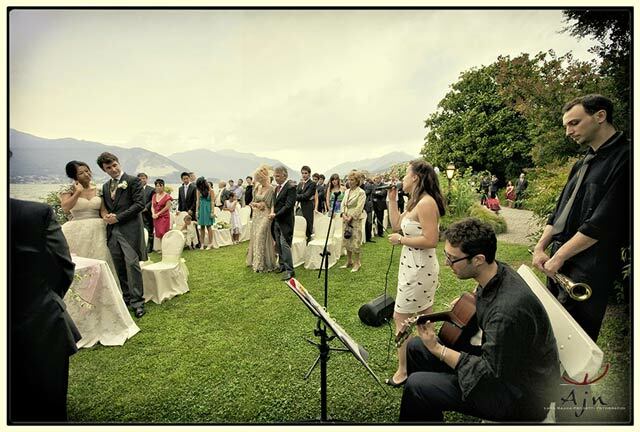 Their Symbolic blessing by the shores of Lake Maggiore was conducted by Diane and Giuseppe in an almost surreal and magical manner thanks to some unusual weather conditions. A storm threatened to break out over the Lake but thankfully changed course. In fact the dark clouds pierced with rays of brilliant sunshine together with a light breeze on the lake contributed to a unique and unforgettable atmosphere. One of the most satisfying aspects of our role as Celebrants is the marrying (literally!) of cultures, nationalities, traditions and of course languages. Lina and Borja’s cermony afforded us the opportunity to construct a script reflecting their many diverse cultural influences. We were immediately struck by the intensity of their relationship and their youthful energy. 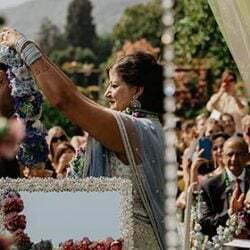 The wedding party was an eclectic mix, including over two hundred guests who had travelled to partake in a multi cultural blessing, celebrated mainly in Italian but also including sentiments and readings expressed in English, Spanish, Chinese and French! The bride and groom were evidently moved by the powerfully emotional speeches performed by friends from all over the world. It was inspiring to witness two people so young and incredibly in love, clearly relishing every word and cherishing such a unique moment in their lives. 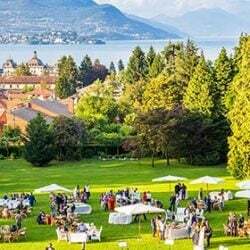 Following the ceremony the aperitif was served on the extensive lawns of Villa Rusconi while classical portraits of family members and friends were taken. The Photography service was expertly conducted by Fabio for Ajn – Luca Rajna Progetti Fotografici. It was a wonderful service with great post production. We are delighted to share some of the most stunning images of Lina and Borja’s wedding with our readers but of course don’t miss the entire PHOTO-GALLERY! Lina and Borja’s wedding was indeed a great event! It was elegant but the bride and groom were also relaxed and friendly with everyone. 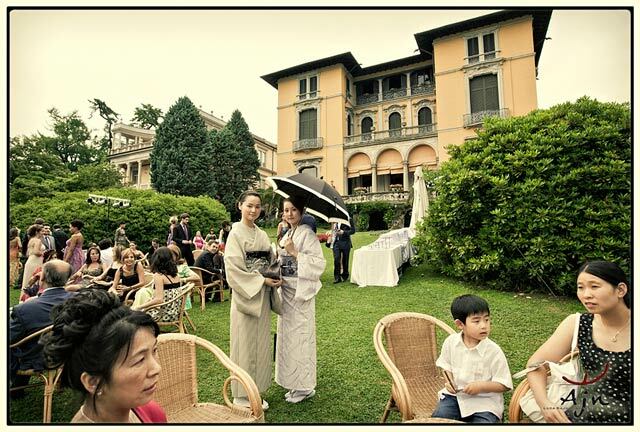 There were many different situations and cultures to be photographed, (not to mention the beauty of Lake Maggiore!). The fabulous climate and perfect organization made the event a wonderful party. Taking pictures for me was an easy and pleasurable task and it was a great professional opportunity! The wedding video was realized by the very skillful Riccardo Lavezzo, a young but extremely imaginative and professional videographer from the Piemonte region. Speaking as cameraman for Lina and Borja’s wedding I would like to take this opportunity to thank them for appreciating our style and for trusting in our ability. We felt free to capture and use images as we perceived them on the day. Having been allowed a free hand on the shooting meant that we were able to work with minimum stress and utilise technology and work creativity with energy and enthusiasm. Villa Rusconi and Lake Maggiore offered a very natural landscape and scenography. Realizing a memory for the bride and groom offered me the possibility to experience and work more efficiently, paying greater attention without the risk of missing those important moments. Every emotion for me was amplified and more vivid. It was wonderful to see how love can overcome distance, cultural difference and how destiny can change the lives of two people such as Lina and Borja… and all due to a chance meeting, which sometimes happens for the benefit of all those involved! The whole event, from the ceremony to the party was accompanied by Desafinado Music Planner and by the fantastic voice of singer Camilla Pagani. Lina and Borja’s wedding was amazing! Great people and a great location, I do love Villa Rusconi! Unfortunately It was a cloudy day and as soon as I arrived I was terribly worried about the weather, can you just imagine a rainy day with our instruments and all the electric stuff we had?!?!? We finally made it! The ceremony was marvellous with the 3 of us only: guitar, saxophone and voice, We welcomed them with “Gabriel’s Oboe” a Morricone masterpiece. Then we had a great time during the aperitif, the male voice, doublebass and drum players joined us and we played some smooth an elegant jazz music and bossanova. Lina and Borja appreciated our Sextet very much indeed! Our DJ arrived after they’d had their wonderful wedding cake and they all went on dancing all night long and really had great fun. I’m so happy I had the chance to meet Lina and Borja and to perform at their wedding. 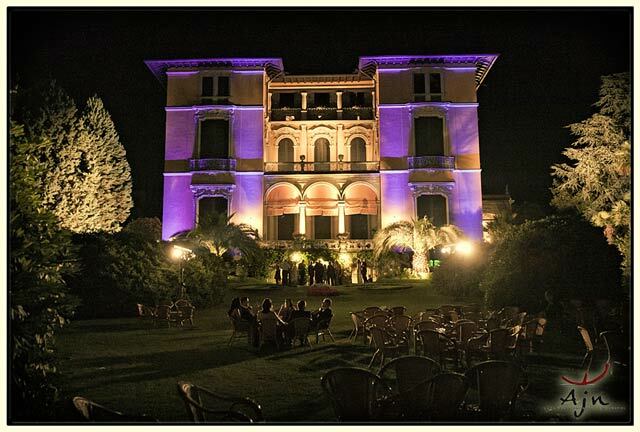 At sunset the dinner was served in the wonderful pavillion of Villa Rusconi… a dinner that soon become a great party! For the evening we decided together with Lina and Borja to create an unforgetable atmosphere! The villa was completely illuminated by a designer who created a unique setting for the evening. Lina and Borja selected a gourmet Menu and fine Wines. But the fun part was the party itself! In spite of being a very big party with more than 200 people the couple experienced an intimate atmosphere filled with a special kind of love. During the dinner the guests were deeply captivated by the singing of Cantico del Camarero – a typical Spanish song which was amusing and added to the sense of levity. After dinner Lina and Borja expressed a desire not only to dance in the villa’s cellar but also to continue the festivities at a nearby disco in order to continue the party! We leave the final words of this post to Lina… We are extremely touched by just how complimentary they are! I love recalling our friends speeches during the ceremony and dinner. Everybody was so happy, having fun and chatting to one other! They were singing Camarero from one table to the other. It seemed to me as if we were all eating together at one large table! We were incredibly lucky with everything: the flowers, dress, weather (not too hot or cold) and everything! I could not have really asked for more! Thanks to everybody for your amazing work!!! 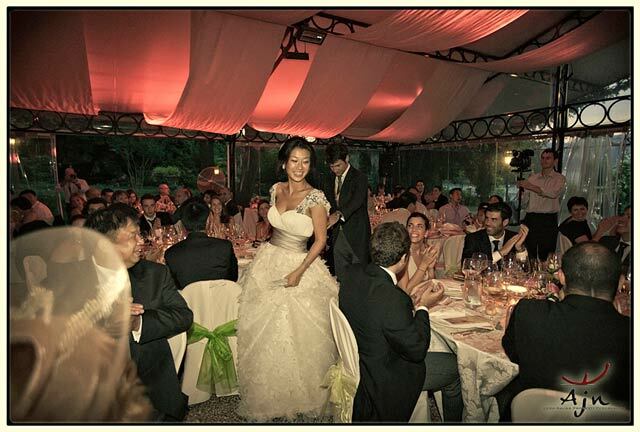 For any information about wedding at Villa Rusconi – Lake Maggiore – please CONTACT US. 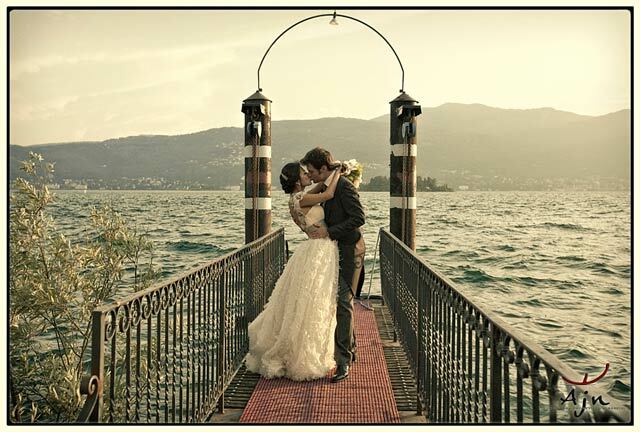 3 Responses to Lina & Borja: Lake Maggiore’s Wedding of The Year! What a beautiful location.. Looks like the Bride and Groom had alot of fun..
Gorgeous.. Gorgeous.. Gorgeous.. I don’t know how I will live up to this. Thanks for sharing!